NEW YORK, NY--(Marketwired - Jan 16, 2014) - Dr. Ramtin Kassir is a triple board certified plastic surgeon who has been featured on television shows such as The Doctors, TODAY Show, Entertainment Tonight, FOX and The Real Housewives of New Jersey. After noticing shifts in the way his patients obtain information and their sources of influence, the go-to plastic surgeon and media expert is predicting the top procedures for 2014. With Mona Lisa Cosmetic Surgery Centers in New Jersey and on Park Ave. in NYC, Dr. Kassir has become a sought after plastic surgeon in the tri-state area. "New technology that has entered into the market will see an all-time high in patient awareness and demand. How my patients are becoming aware of procedures as well as their sources of influence are driving my predictions for 2014," says Dr. Kassir. 2013 saw a 31% increase in requests for surgery as a result of social media photo sharing. "Last year I experienced a 700% increase in patients seeking cosmetic procedures from social media," says Dr. Kassir. Of the procedures requested as a result of social media influence, rhinoplasty topped the list. Due to this rising trend, Dr. Kassir predicts Celebrity Rhinoplasty procedures will see a rise in popularity in 2014. Popular noses in Hollywood will become new models for those seeking a new nose. As advances in plastic surgery are made, procedures are becoming less invasive and non-surgical alternatives are now available. Alongside social media's influence for Rhinoplasty, 'before and after' photos have increased the demand for the Facelift procedure. Procedures such as Dr. Kassir's signature non-surgical facelift procedure (the K-lift®) and FDA-approved non-surgical skin tightening treatments such as Ultherapy are predicted to surge this year. "My patients are beginning to learn more about Ultherapy from seeing it featured on shows such as The Doctors and TODAY Show. They are requesting it by name and are referring their friends and family after seeing the natural and noticeable results," says Dr. Kassir. The cosmetic injectable BOTOX has steadily remained the number one most requested non-surgical cosmetic treatment. In recent years, additional non-surgical procedures have entered the market-for skin tightening, cellulite and fat reduction. FDA-approved in 2010, CoolSculpting for fat reduction is quickly becoming the most sought after option for an alternative to the liposuction procedure. "With a jumpstart from weight loss resolutions during the month of January, followed by wanting to get in shape for the warmer months, I predict CoolSculpting will become the hottest procedure this year," says Dr. Kassir. CoolSculpting's affective and irresistible taglines include: "If you can squeeze it, you can freeze it" and "Transform your body without surgery or downtime". About Dr. Ramtin Kassir M.D. Dr. Kassir is Triple board certified by the American Board of Facial Plastic and Reconstructive Surgery, the American Board of Otolaryngology, American Board of Sleep Medicine, and is a fellow of the American College of Surgeons. Dr. Kassir has been in private practice since 1997 and has extensive experience in the fields of facial plastic and cosmetic surgery, endoscopic surgery and laser surgery. His work has been featured on CBS's The Doctor's, NBC's Today Show, Entertainment Tonight, FOX News, and The Real Housewives of New Jersey. 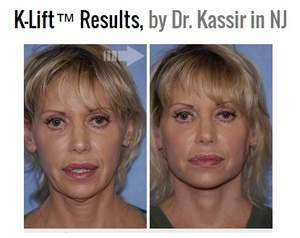 K-Lift (non-surgical facelift) Before and After by Dr. Ramtin Kassir-20 minutes after procedure.